Sometimes the way I reward the completion of a work week is with something savory that I wouldn’t typical eat. Something rich, creamy and a little bit naughty, but only in small portions. Today’s Foodie Friday recipe is one that I just recently came across thanks to my mother, as we are both trying to attempt one Julia Child a month. I introduce to you my take on Julia Child’s Swiss Tart. The trouble with limiting the recipe to Swiss is that I know there are so many other cheeses out there that are aching to take part, so I substituted one of my favorite cheeses, fontina, for the Swiss which was originally listed. And again, my camera was not at the ready when I made these tartlets over the weekend, but I couldn’t wait to share them with you. It tastes as though you are enjoying mini quiches, although without the vegetables and bacon. I do think you’ll enjoy it for either a savory treat in the morning at brunch, or, as I did, for palette cleanser at a wine tasting party. Feel free to switch up the cheese to your liking. Make sure the butter is chilled and don’t slack on it as it is what makes the crust flaky. Be sure to roll the dough out to as thin as you can manage. Again, this creates a more flaky crust. To make the tart shell (pastry), mix flour, sugar, salt together. Cut in butter until it resembles corn meal (my time saver trick is to use a food processor – less than 2 minutes your dough is evenly mixed and ready to be rolled out). Add the water. Roll dough into a ball and flatten into a disc. Wrap in plastic wrap. Chill for 30 minutes. Roll out the dough on a floured cutting board. Roll as thin as possible, keeping it even. 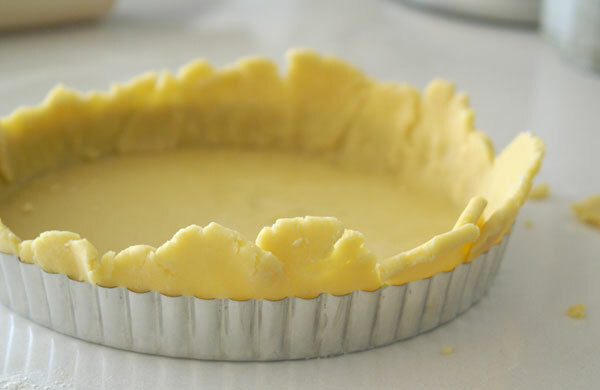 Using one tart pan: Prepare your tart pan and place dough gently inside, letting the dough go above the edges about 1/2 inch. Neatly pinch the edge around the entire tart. Using muffin tins (this recipe makes 12 tartlets): Cut out circles and place in each muffin container so that the dough comes half way up the sides. Mix together the heavy cream, egg, Worcestershire sauce, hot sauce, salt and pepper. Whisk until all ingredients are mixed together. Place the cubes of fontina on the bottom of the prepared crust that it is full (one layer only). Pour the heavy cream mixture over the top of the cheese just until it is just about to go over the crust, but not quite. Place in the oven – 30 minutes for one 9 inch tart dish, or 20 minutes for tartlets. Remove when cheese mixture is just barely golden brown. Cool for 5 to 15 minutes. Enjoy! Oooh! I can smell the aromas from here. I’m a sucker for anything with cooked cheese. Just printed your recipe (hope that’s OK). Enjoy Shannon; you deserve your treat! She was a genius! DId you read her book “My Life in France”? Fabulous! I know it can’t possibly be a half cup of Worcestershire. Maybe ½ tsp? Fontina sounds delicious and fragrant!